This dinner is probably one of the most frequently cooked midweek meals in my kitchen. 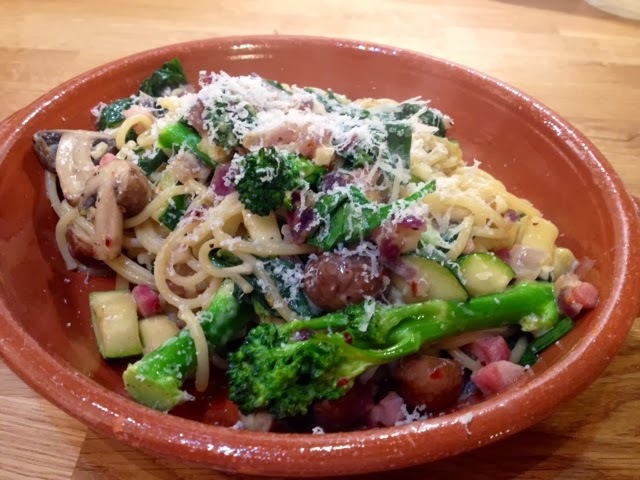 Pasta takes just a few minutes to cook, fresh vegetables are tasty and nutritious and mascarpone makes a really quick and tasty sauce. This is a great staple recipe to use over and over again and adapt to the ingredients you have in your fridge. The vegetables can be swapped out for any other green veg you have to hand. I regularly use peppers, spinach and frozen peas in a dish like this (spinach can be thrown in right at the end). 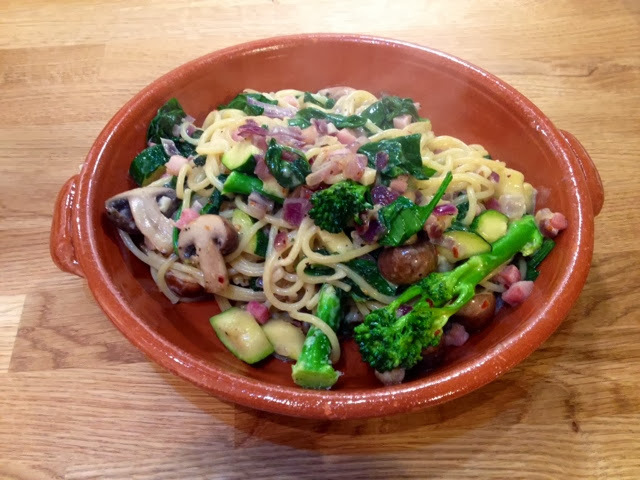 Pancetta can also be substituted for plain old bacon or ham and even the mascarpone can be swapped for soft cream cheese. This dish is so simple and versatile yet will always remain one of my all time favourite mid week meals. 1. In a saucepan full of boiling water, add a pinch of salt and cook the spaghetti according to the packet instructions. 2. 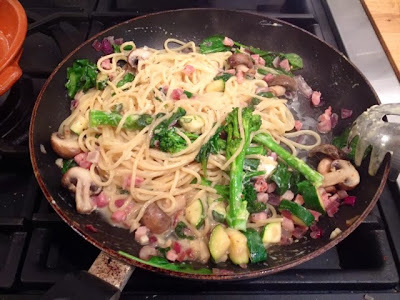 Meanwhile heat a little oil in a large frying pan and add the pancetta and onion. 3. When the pancetta is cooked a little and the onions softened, add the garlic, broccoli and courgette. 4. When the broccoli has softened, add the mushrooms and fry for a further few minutes to cook the mushrooms. 5. When the spaghetti is cooked, drain reserving a little of the pasta water. 6. Add the pasta and the reserved water to the frying pan, stir in the mascarpone and dijon mustard until melted and thoroughly mixed through. 7. Add salt and pepper to season. 8. Grate over fresh parmesan.